There is also a valet mode that holds rpms to 4,000, limiting horsepower and torque output, locking out first gear and prohibiting upshifts earlier than normal. What’s more, traction, steering and suspension controls are set to their street settings; paddle shifters, drive modes and launch control are disabled and ESC is enabled to full-on. It takes a four-digit code to activate valet mode as well turn it off. This safeguards your Hellcat from free-spirted valets or from anybody else taking it for an unauthorized, full-power joy ride. 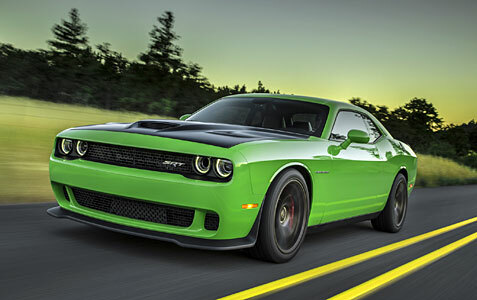 Implicit in locking out those controls is that the Hellcat has them in the first place. Owners will be able to choose transmission shift speeds, steering ratios, paddle shifters’ shift rates on the automatic gearbox, traction control and the suspension settings. The pre-configured drive-modes are sport, track and default settings. There is also a mode that lets the driver customize the settings. While screeching around Portland’s raceway, our Hellcat was in track mode. The readouts told us how much torque and horsepower were being used in real time, the g-forces the car was generating, and of course, oil temperature, oil pressure and voltage output. That was just some of the data; there were multiple screens of information including a zero to 60 mph timer. For this Challenger, designers benchmarked and updated the styling of the 1971 Dodge Challenger. The car has a new vertical split grill and a power bulge aluminum hood with cold air intake. The hood on the Hellcat has dual air extractors and an inlet port that feeds air into the engine air box. Quad headlamps were more detailed than on the last Charger, and the car has a larger front splitter designed for optimal downforce to minimize lift. At the rear, tail lamps features Dodge’s new LED graphic with its smooth glow of light. 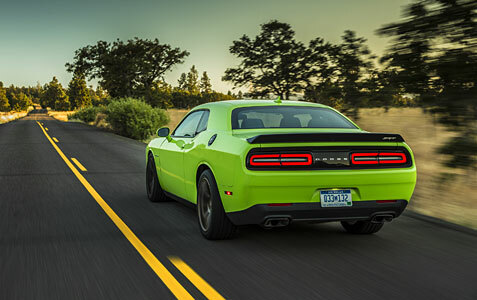 The Hellcat has a redesigned rear valance that gives it a more planted on the ground look, and it boasts a taller rear spoiler with a raised SRT logo. Inside, the Hellcat instrument panel has a stamped aluminum bezel, a configurable driver information display screen, and the analogue speedometer and tachometer are finished in dark red. There’s also an 8.4-inch UConnect screen, and the eight-speed transmission has a T-lever shifter while the manual gearbox features a ball shifter. The individualized sport seats can be heated and cooled, the heated steering wheel warmed the entire wheel, and Mopar, the automaker’s in-house customizing parts operation, has developed 100 accessories for the 2015 Dodge Challenger in all its iterations. The only quibble we had was that it was near impossible to see on the rearward angle that takes the eye to the C-pillar while backing up. But we see no problem in learning to adapt and live with that idiosyncrasy, because the 2015 Dodge Challenger SRT Hellcat has raised the bar for American-made muscle cars by a bunch.